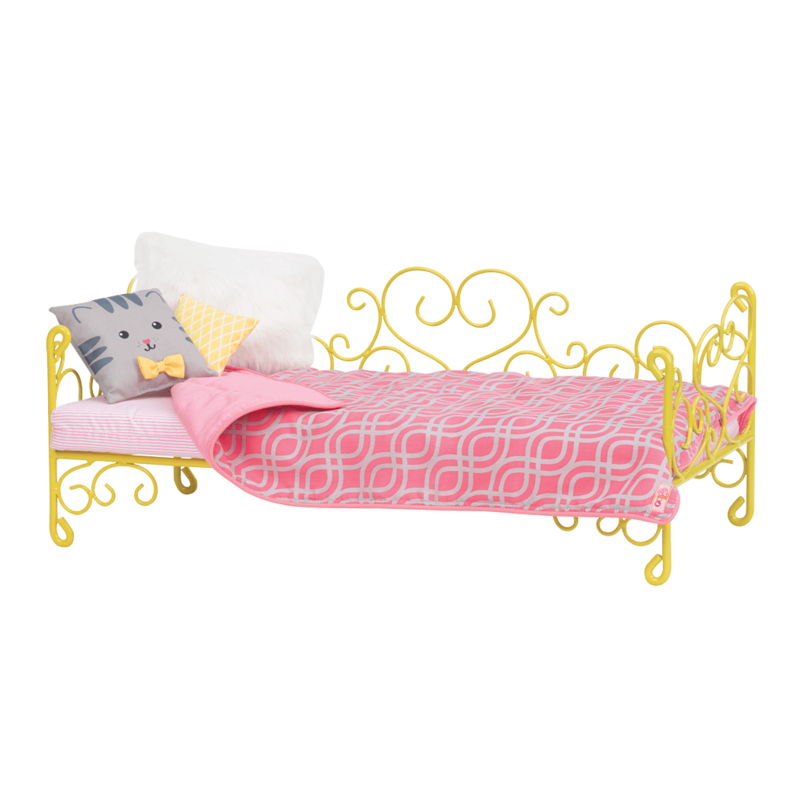 https://s3-ca-central-1.amazonaws.com/media.ogdolls/20180920184109/BD37362-Holiday-Celebration-Set-Single-03%403x.png Category: House and Home. Create holiday magic with this Christmas tree for 18-inch dolls! 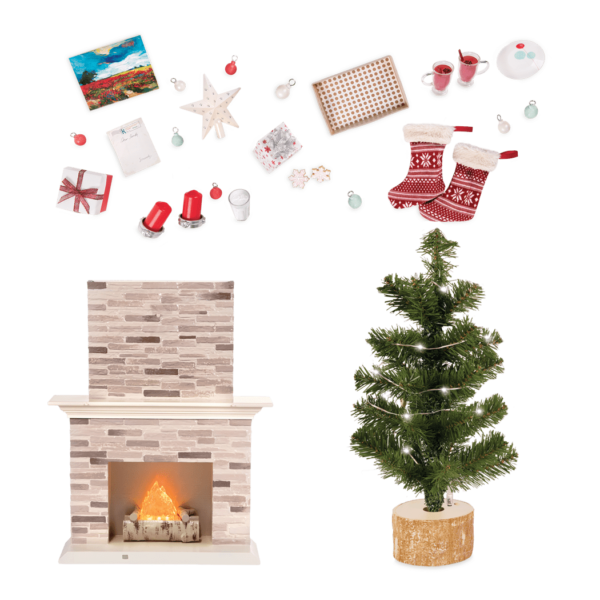 Warm your heart by the cozy fire, with a holiday set that is sure to inspire! Create a warm and welcoming holiday scene for your dolls with the Generation Holiday Celebration Set for 18-inch dolls! 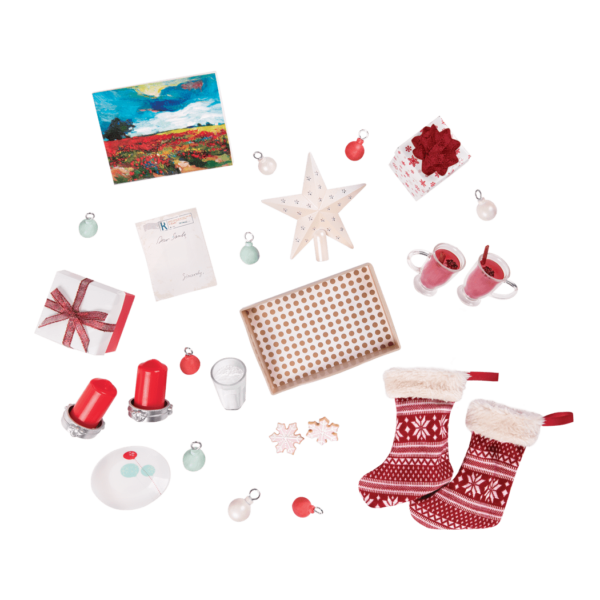 This accessory set for dolls has everything you need to celebrate Christmas with your doll best friends. Because our generation of girls is filled with warmth, even when the chill in the air is biting our noses. We’re learning what’s truly important in this world. We’re raking leaves to earn spending money for gifts, shoveling out a neighbor in need, and even volunteering at school to turn the cafeteria into a winter wonderland worth celebrating. This is our time. This is our story. The best part of the holidays is celebrating with those we love! Set up the fireplace to create cozy holiday magic. 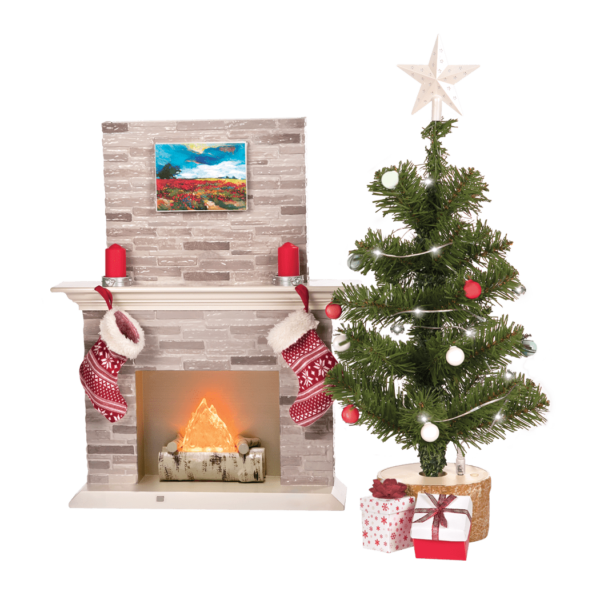 The fireplace flickers and makes sounds for extra realistic detail! Decorate the mantle with stockings and miniature candles. Next, set up a Christmas tree for your dolls. The attached string of lights really light up! Add some ornaments and the pretty star on top for the finishing touch. Place some adorable gifts under the tree, and let your dolls sit back and enjoy their sparkling holiday wonderland with a cup of warm cocoa and a place of cookies! 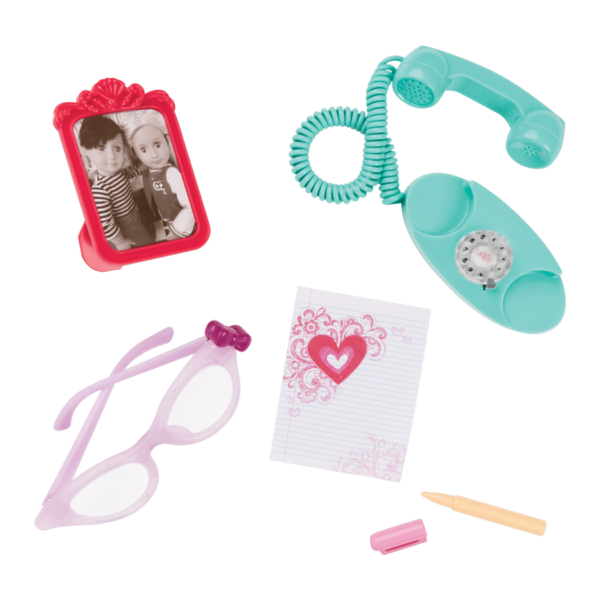 Create a special holiday world for your dolls with all of the great Our Generation accessories and outfits to choose from! After all, the holidays are for sharing with the special people in your life, even your dolls! The dolls pictured with the Holiday Celebration Set are Ginger and Sia, two beautiful deluxe dolls from Our Generation. 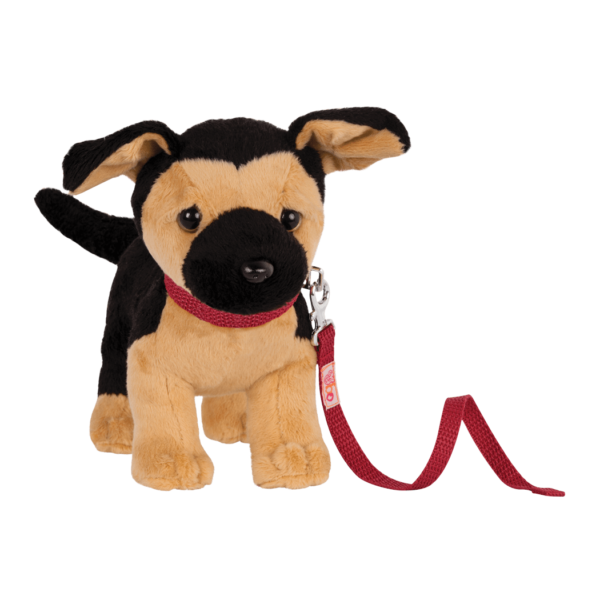 Ginger is part of the Holiday Collection, and she comes with her very own storybook that tells about her adventures celebrating Christmas with her family in another country! Discover all of the other wonderful Our Generation Holiday items, like the beautiful Winter Wonder Sleigh which can dash through the snow with the gorgeous Holiday Clydesdale Horse. 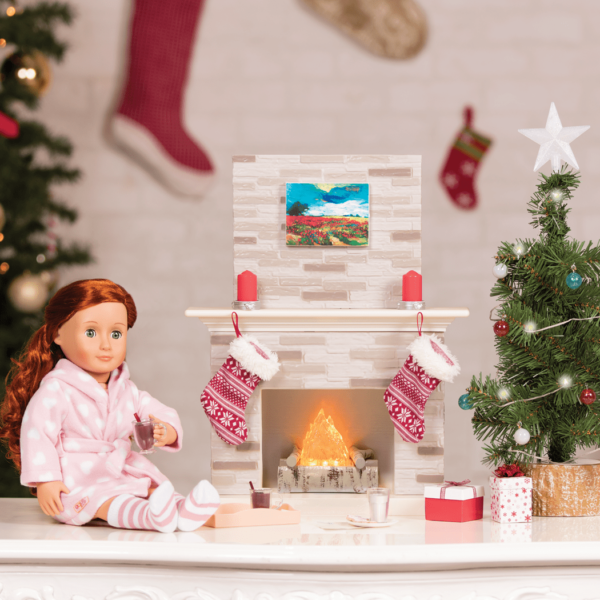 When your dolls aren’t relaxing beside the fireplace, dress them up for holiday sparkle in the Cocoa Cozy outfit or the Celebration Style outfit for 18-inch dolls! Includes fireplace, Christmas tree, presents, stockings, and more! Fireplace has working lights and sounds! You can have fun playing with the Holiday Celebration Set right away after a quick set-up. The Holiday Celebration Set arrives with batteries already installed. To activate the fireplace, simply push the button on the front of the fireplace. To activate the string of lights on the tree, first plug them into the base, and then press the button on the base. Don't forget about the "Try Me" button! If the accessories are in "Try Me" mode, the lights and sounds will stop after a few seconds. I purchased this set on sale for about twenty dollars! It was not during Christmas time, but I still wanted it really bad! The detail put into this set astonishes me! I am now very excited for next Christmas so, I can decorate my doll’s room. The boxes were flimsy but that’s understandable because human sized boxes are flimsy too! Another great product Our Generation! I really like the flickering lights and sounds for the fireplace! And the lights on the tree are terrific! I only wish the star on top lit up too. A really fun set! This is best my elf on the shelf is goes on this set I recommend this a good xmes present!